Jenny Levecke joined the practice in 1987. She maintains a family oriented practice, including most facets of dentistry. Jenny has completed further training in Cerec CAD-CAM, the restorative aspects of dental implant treatment and Endodontics. 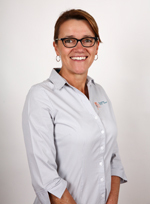 Jenny is a member of the Australian Dental Association (Vic Branch) having served on several sub-committees. She is also involved as an examiner of overseas trained dentists for the Australian Dental Council.